A warm welcome to all pets, clients, and animal lovers! At our veterinary centre, we go above and beyond in every way to make sure your pet receives the highest standard of comfort, love, and attention. Your pet is special to us! With two vets on-site, we are very proud to guarantee that your pet is safe with us 24/7 and is always treated with the highest level of kindness and compassion. Your pet is cared for 24/7 by the same vets and small dedicated team who know your pet and their history. We do not out-source or use branch clinics for our emergency services. Many practices "lock-down" at night – we don't. We (John and Margaret) are the owners and veterinary surgeons and are on-site to keep an ever watchful eye on our in-patients. We can hear them at all times and constantly monitor their comfort, stress and condition. Your pets are never alone! Not all practices are the same when you go behind the scenes. We go way beyond normal care standards and openly invite you come for a behind the scenes tour to see for yourself. The best judge of the care we provide is our clients – they highly recommend us and are amazed at just how much we do for them and their pets. We are proud to show you what makes us unique. You will not find better treatment anywhere! Read what clients are saying. Your convalescing pet is nurtured by our care team for the best stress and pain free recovery possible – we far surpass all others in this area! Three separate recovery wards for dogs, cats, and small furries significantly reduce stress on pets. Our dog ward has 3 full size walk-in kennels with individually controlled under floor heating. All recovery wards have separate thermostats, dimmer lighting, pheromone diffusers, and the most comfortable ultra plush wall-to-wall bedding imaginable. Be aware that many vets now use factory-style operating theatres. This means that your pet is transported long distances in the back of a van with other animals to a central "processing" clinic. We think this is terrible and very stressful for pets! 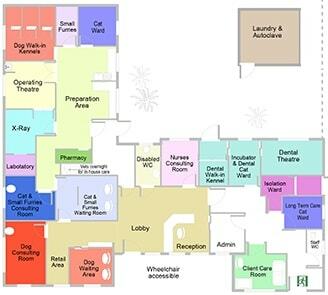 We choose to manage all standard and (where appropriate) emergency treatment from our practice right here at our top quality, fully equipped Cossington facilities. Your pet is operated on and cared for 24/7 by the vets who know and care about your pets! Fewer people come in contact with your pet throughout its treatment because we have a small, dedicated team at our clinic. Unlike the "factory" approach, your pet is more trusting of familiar care-givers, which reduces their stress. A small team also reduces the risk of miscommunication – each staff member knows first hand your pet's condition, what treatment they are receiving, and your specific concerns. Clients tell us that they too are more comfortable with familiar faces and happy to know who is caring for their pet. Kind, compassionate care is our top priority. 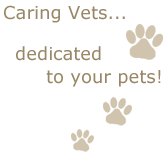 We nurture our pet patients and care about you their owner. Owners are welcome to visit their pets because we know that your special bond helps the healing process. For the difficult time when pets come to the end of their lives, a private, restful care room is available for you to share those last precious moments. For your convenience, we have extended opening hours. Also, our consultation appointments are longer to provide the special attention your pet deserves and ample time for you to ask questions. Our philosophy is that, if an owner is better informed, then they can make better choices. This helps their pet maintain a healthy life and helps reduce future vet bills. Pets should not be treated with any less care than people are for surgery! We take hygiene very seriously and have stringent surgical standards. Our investments in equipment and new technologies include digital x-rays and professionally equipped surgical theatres. Keeping your pet safe, comfortable, and pain free at all times is a top priority. We never compromise your pet's safety and comfort by taking short cuts or cost cutting approaches. We made a significant investment in the clinic when we purchased it, creating a custom designed top class facility down to the finest details. Some of the improvements include major renovations in the clinic facilities plus substantial investments in upgraded standards and modern technology. We go above and beyond to deliver the best care possible for your pet!